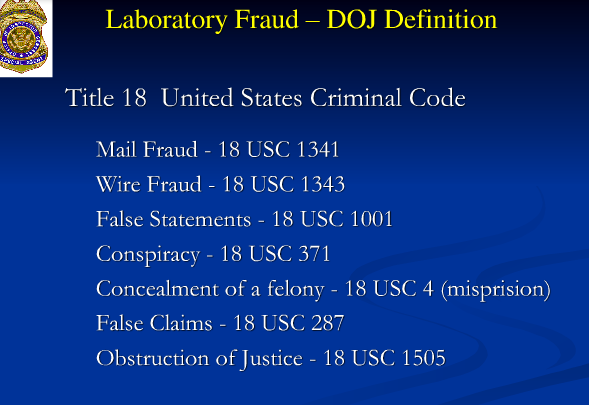 Laboratory developed tests (LDTs) have no FDA or CLIA oversight. Avoiding regulatory oversight is just one of the ways those involved in the use of these tests avoid accountability. Without answerability to third parties they have essentially removed themselves from consequences. 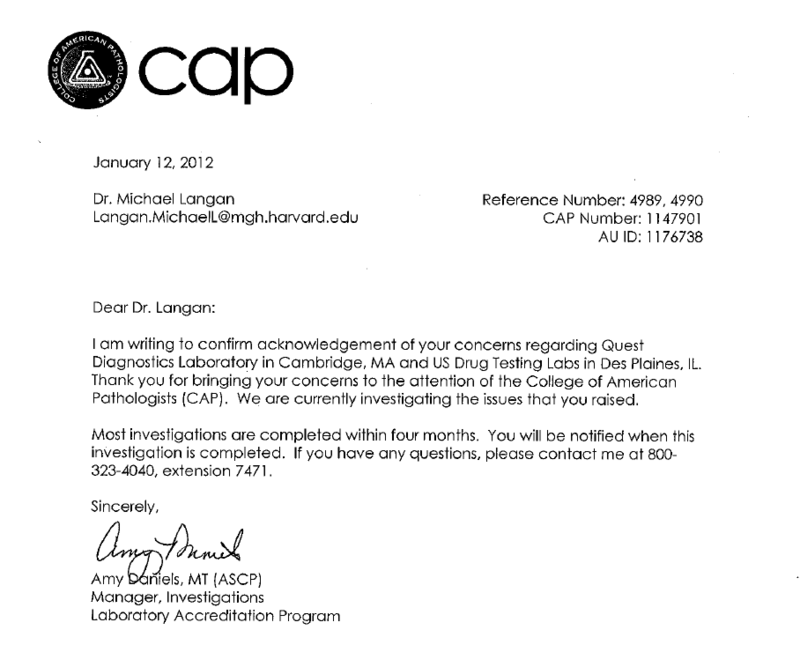 College of American Pathologists (CAP) accreditation is the sole avenue for complaint. CAP does not sanction. They only have the ability to educate lab to come under compliance with CAP standards under threat of loss of accreditation and it is under this threat that they can force a laboratory to correct both unintentional and intentional errors. 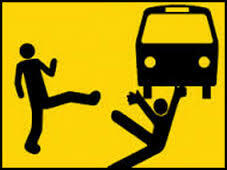 This is what was done in my case. I filed a complaint with CAP in January of 2012. The “Litigation packet ” showing forensic fraud was sent to CAP and I was informed that the investigation could take many months. 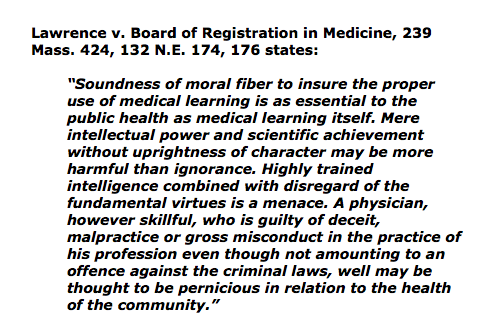 In October of 2012 I was suddenly reported to the Board of Registration in Medicine for “noncompliance” with AA meetings (that were the sole and direct result of this test) and action was taken against my medical license which resulted in my suspension. In December of 2012, the Chief Investigator for CAP, Amy Daniels called me to see how I was doing in light of the “amended” test. She told me that the test had been invalidated on October 4, 2012. 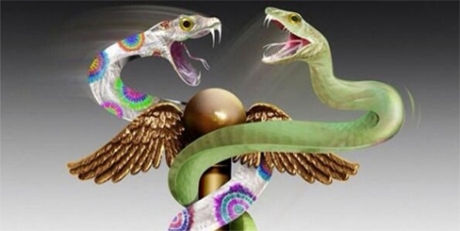 I told her this was news to me as I was in the process of being suspended for “noncompliance” and called the Director of Operations at Physician Health Services (PHS) Linda Bresnahan who predictably told me she was unaware of any revision to the test. 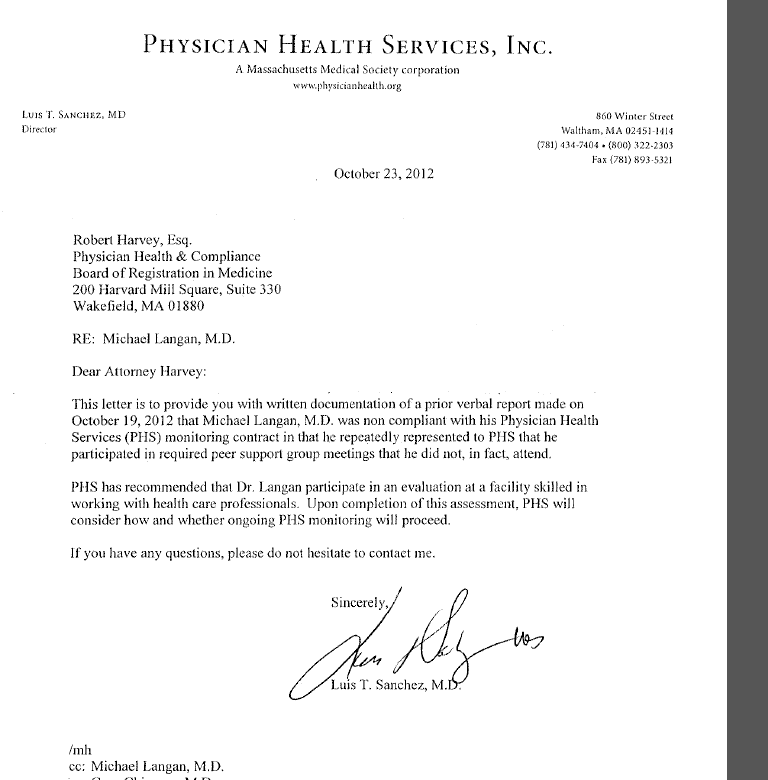 But the very next day a letter was sent out signed by PHS Medical Director Dr. Luis Sanchez, M.D. stating that they had just found out about the amended test on December 10. 2012, the day before when I called them. Interestingly the letter acknowledged the invalidity of the test but stated PHS and the BORM would “continue to disregard” it. Sanchez also made it a point in the letter to state they were were not aware of any consequences resulting from it. They denied any knowledge of an October 4, 2012 revision which would have been 67-days earlier than this acknowledgment and dismissal of the test. In response to 93-A demand letters from my attorney for fraud, PHS, Quest and USDTL all refused to consider any damages by blaming my suspension on me. They claimed my suspension was due to my “noncompliance” with attending AA meetings that was officially reported to the Board October 18, 2012. The claimed the test that was used as a stepping-stone for all subsequent adverse events was completely irrelevant and had nothing to do with anything. This is what is known as “moving the goalpost.” What they did not know was that I would eventually be able to get the document proving they knew what they knew and when they knew it. The response letters revealed important information that was previously only speculative with no way to prove. Both labs, in defense, claimed that the test was sent as “clinical” specimen at the request of PHS (an ultra vires out of scope act as they are a 503(B) charity. PHS is not a healthcare provider and is not authorized to practice medicine. PHS and the labs were apparently unaware of the new HIPAA Privacy rule that requires labs to provide patients with their lab tests without approval from the agency ordering the test. 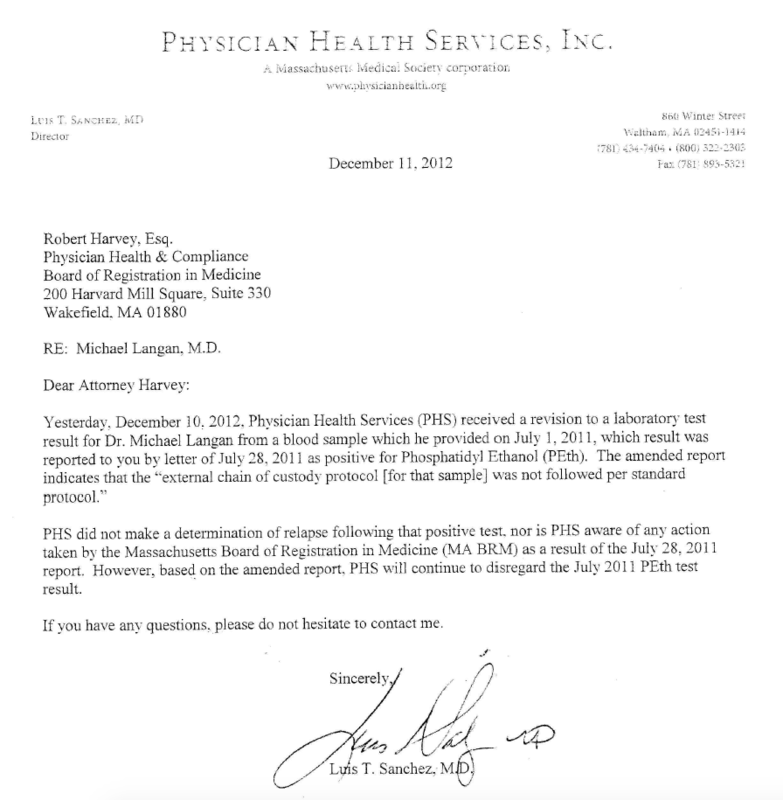 PHS had previously refused to provide labs by hiding under confidentiality and medical records regulations. 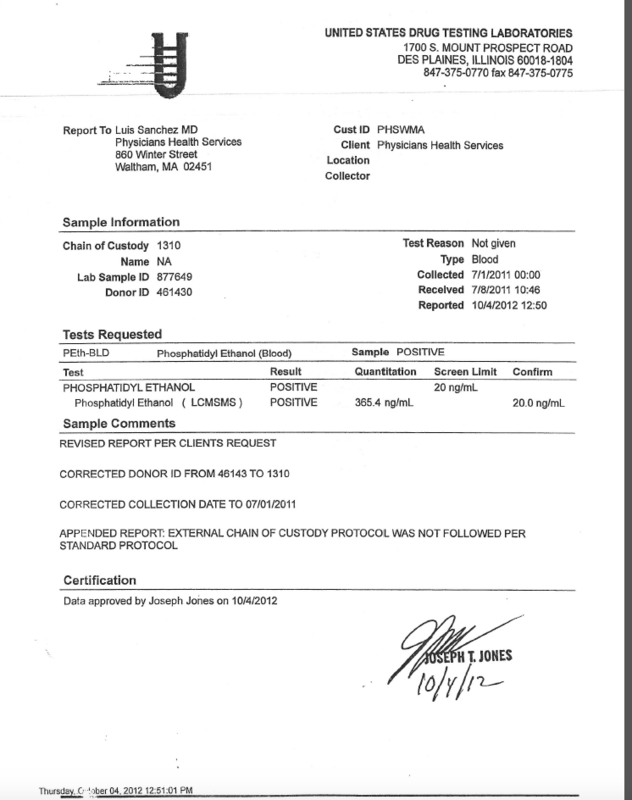 At first they refused but CAP and the DOJ -civil rights division forced USDTL to provide the document below dated October 4, 2012 informing Dr. Luis Sanchez of the amended test he reported in a signed letter to a state agency that he had just found out about December 10, 2012. The letter undeniably shows Sanchez lied to a state agency in a written letter. This is also a prima facie crime. It is just one of many crimes that Board Attorney Deb Stoller has facilitated for PHS as her job is to ignore, suppress, minimize and deflect any criminal acts committed by PHS and protect them. And this needs to be made public. PHS needs to be held accountable. So too do the actions of Ms. Stoller whose job as an agent of the state makes her involvement even more egregious than the perpetrators. 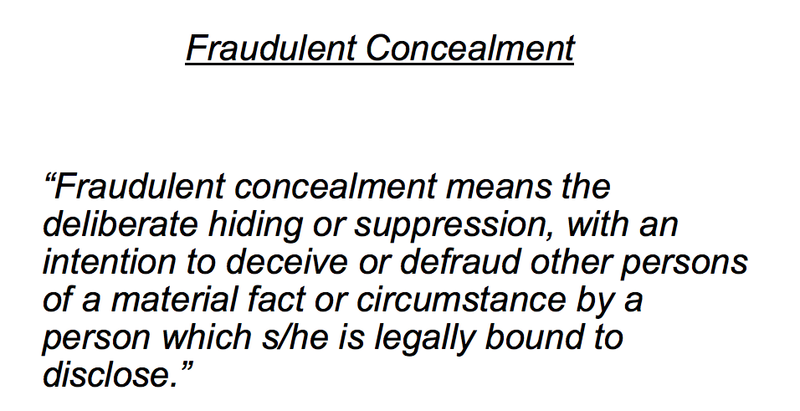 The documents below show a clear violation of M.G.L. 256 (B) Section 69 done under Color of Law. This statute prohibits the making of any false, fictitious, or fraudulent statement to the United States or a government agency. This statute is exceedingly broad: It covers any statement or representation made to the government or any of its agents. A statement can be made either orally or in writing, and it can be sworn or unsworn. via Helpful resources for those abused and afraid — via http://www.bmartin.cc .